Thanks very much for your report on your meeting with the DARPA people, and for the information you sent on the INTERNET protocol, TCP and the packet radio article. 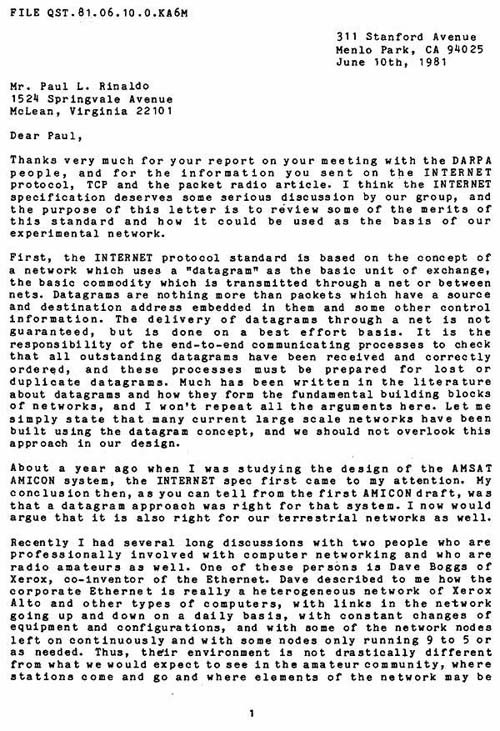 I think the INTERNET specification deserves some serious discussion by our group, and the purpose of this letter is to review some of the merits of this standard and how it could be used as the basis of our experimental network. First, the INTERNET protocol standard is based on the concept of a network which uses a "datagram" as the basic unit of exchange, the basic commodity which is transmitted through a net or between nets. Datagrams are nothing more than packets which have a source and destination address embedded in them and some other control information. The delivery of datagrams through a net is not guaranteed, but is done on a best effort basis. It is the responsibility of the end-to-end communicating processes to check that all outstanding datagrams have been received and correctly ordered, and these processes must be prepared for lost or duplicate datagrams. Much has been written in the literature about datagrams and how they form the fundamental building blocks of networks, and I won't repeat all the arguments here. Let me simply state that many current large scale networks have been built using the datagram concept, and we should not overlook this approach in our design. About a year ago when I was studying the design of the AMSAT AMICON system, the INTERNET spec first came to my attention. My conclusion then, as you can tell from the first AMICON draft, was that a datagram approach was right for that system. I now would argue that it is also right for our terrestrial networks as well.